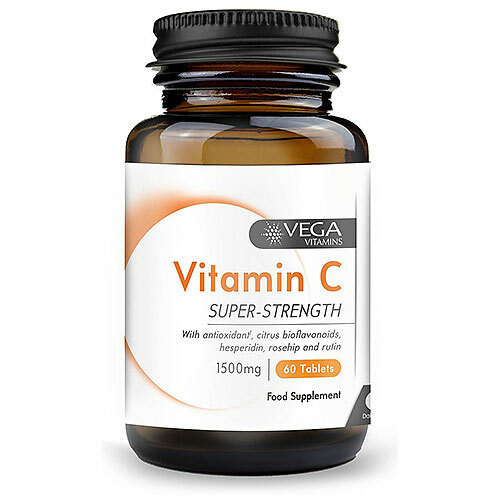 Vega Vitamins Vitamin C formulation is fortified with a combination of natural citrus bioflavonoids and rose hips (Hesperedin, Rose Hip and Rutin) for maximum effectiveness. Vega Vitamins has a wide range of products that promote a holistic approach to health and good living and pays close attention to diet, exercise and emotional health. Vega Vitamins products are manufactured to help maintain a high level of purity that may be suitable for whatever need and whichever lifestyle. Vitamin C (Ascorbic Acid), Microcrystalline Cellulose, Citrus Bioflavonoids Complex (Citrus aurantium), Hydroxypropyl Methylcellulose, Tablet Coating (Hydroxypropyl Methylcellulose, Glycerin), Anti-caking Agents (Silicon Dioxide, Magnesium Stearate), Croscarmellose Sodium, Rutin, Hesperidin, Rosehip Powder (Rosa canina). As a food supplement for adults, take 1 tablet daily with food or as directed by a healthcare professional. Do not exceed recommended intake. 1500mg of vitamin C may cause mild stomach upset in sensitive individuals. 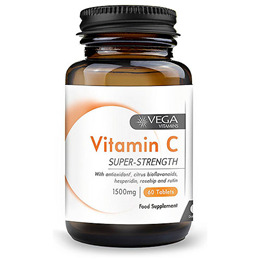 Below are reviews of Vega Vitamins Vitamin C - 60 x 1500mg Tablets by bodykind customers. If you have tried this product we'd love to hear what you think so please leave a review.